Guy Tillim: Leopold and Mobutu is at the Photographers' Gallery, London W1, until September 25,2005. Details:020-7831 1772. Africa wants to change its image - but african war history casts a long shadow. Traveling in Africa, you sometimes find it hard to avoid being scared or, perhaps more honestly, creepily thrilled by horrors that catch you entirely by surprise. Driving by the seaside, you notice big numbers on placards on the dunes. What are they? Oh, that's where the ex-president used to have people shot.This has been a year in which such images were supposed to be turned upside down. The thesis of the Africa 05 festival is that we have become too used to bad news from the continent. Pictures of disease, war, starvation are all we see, with the life and joy of millions of people ruthlessly edited out. So instead, the year of the G8 debt cancellation has seen BBC reports on Uganda's flourishing tourist industry, a show at the Hayward Gallery that insisted on the urban modernity of African art and an African garden at the British Museum. As cultural politics, this is naive stuff. Why is it, asks the journalist and historian Martin Meredith in his book The State of Africa: A History of 50 Years of Independence, that having been, in the 1950s, a beacon of hope and optimism, Africa today instills foreboding and pessimism - "a scar on the conscience of the world", as Tony Blair would have it? Meredith's explanation is the opposite of the one propounded by Africa 05. The organisers of the image-changing festival believe that bleak views of Africa are ultimately racist. Meredith, though, thinks the alarm the continent inspires entirely justified: his book chronicles the coups, kleptocracies, wars and economic follies that have not only retarded but actually reversed growth. "In such a survey as Meredith's it would be good to read more about the positives in Africa," objects a reviewer in BBC History magazine. I suppose you could make the same objection to South African Guy Tillim's exhibition at the Photographers' Gallery. It speaks well of Africa 05 that it supports this show because Tillim's pictures, taken in the Democratic Republic of Congo (DRC), could easily be titled Africa - The Bad News. These are representations of mobs and refugees, decay and suffering, in a place that appears utterly cast adrift from reason, whose history - ominously visible in Tillim's photographs - is mad, chaotic and evil. Can there be a bleaker, more desolate prognosis for the future of humanity than the sight of children in uniform and camouflage, training as soldiers? Yet that is what you see in Tillim's pictures. Here are the youth of Africa drilling in a Congo forest with sticks, which they hold lovingly, rehearsing for when they get a gun. These are not straightforward news pictures. They attempt to reveal the ghosts and shadows of the past that determine the present. So many pictures from war zones and famine areas are just fragments of pain and inexplicable cruelty - bad things happening. Tillim's exhibition is, by contrast, an essay in visual history. He tries to photograph not an unaccountable present, but a catastrophe whose causes lie in a terrible past. The exhibition is named after two ghosts who are seen in these pictures indirectly, through their relics. It is called Leopold and Mobutu. A soldier splashes in flip-flops in the ruins of a palace with charred rafters that will soon collapse into the encroaching grass; chandeliers still hang in a ballroom whose walls are stained and whose doors look out on the advancing bush. This is the palace Mobutu Sese Seko built, then left to looters and the wilderness when he fled in 1997. He had come to power in Kinshasa in 1960 after the elimination of the charismatic socialist Patrice Lumumba. The Congo dictatorship of Mobutu has been called the original African "kleptocracy" - a state that existed purely to serve the interests of its ruling elite, whose sole object was to steal currency reserves, strip industrial assets and basically make as much money as they could while the good times lasted, in this case nearly 40 years. Supported by the US and the CIA because he was anti-communist, Mobutu even managed to be glamorous for a while - not least when he hosted the classic fight between Ali and Foreman, the "rumble in the jungle". But he was a thief on a grand scale who left a country that possessed huge mineral resources in dire poverty. Behind this ghost, in Tillim's photographs, hovers the pale phantom of Leopold II, King of the Belgians. Whatever his crimes, Mobutu was almost gentle in comparison with the man who invented the modern Congo. Leopold was one of the first European leaders to see the potential for loot in Africa. In 1876 he held a meeting of explorers to whom he explained his "philanthropic" plans for the continent that was only just being mapped. With the help of the Welsh-born journalist and adventurer Henry Morton Stanley, he created the Congo Free State. It was here that Europeans discovered a "darkness" within themselves: a greed, a rapacious inhumanity. That is the meaning of Joseph Conrad's novella Heart of Darkness, published serially in 1899. Conrad had captained a Congo steamer in 1890; he nearly died of malaria. His tale of Marlow's quest for the lost ivory dealer Mr Kurtz is a systematic dismantling of the imperial myth as Marlow sees the futile cruelty of Leopold's colony, where, as Victorian photographers documented, workers were maimed as a routine form of discipline. Tillim's photographs home in on relics of Leopold's colony: a model of a soldier from his murderous Force Publique in the Military Museum in Brussels, a peeling portrait of Morton Stanley, the overgrown terrace of the explorer's house overlooking the river Congo. For anyone who has read Conrad, these factual remains slip, eerily, into fiction. The exhibition may be called Leopold and Mobutu but the monster in the forest is Kurtz. 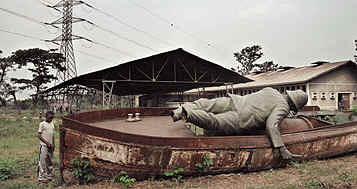 A green colossus of Stanley, torn down by Mobutu, lies on its face. But look what it is lying on: a rusting steamboat like the boat in which Marlow searched for Kurtz. Another chillingly beautiful photograph was taken from the nose of a Russian transport plane above the eastern DRC. The Congo cuts jaggedly through the misty forest, exactly as when Marlow looked at the newly charted African interior and was transfixed by "one river especially, a mighty big river, that you could see on the map, resembling an immense snake uncoiled, with its head in the sea, its body at rest curving afar over a vast country, and its tail lost in the depths of the land. And as I looked at the map of it in a shop-window, it fascinated me as a snake would a bird ..."
Fascination: that word. We're back to the politics of representation. Is it helpful to imagine Africa like this? For there is no avoiding it. Tillim's photographs have a hypnotic pleasure. We are entering the Africa of Conrad's imagination. Is this anything more than racist fantasy? Do Tillim's photographs create a myth of African "darkness"? Only if he made up the child soldiers and the refugees. A visitor to Africa will see creativity, generosity, courage and resourcefulness. But only a very well-shielded tourist can be blind to the fact that it will take more than positive images to make Mr Kurtz a stranger here. For the last news about African War you should join our African Art Club and become an insider of the African art market.